Goodness, I know I’ve tried. Since Monster Hunter exploded on the PSP, I’ve always felt that this was a series I should be into. Like, it was a requirement for me as a resident of Japan. But yet, I could never quite get into Monster Hunter. There are various reasons why we can’t get into certain games, whether it’s the story, the characters, or the art design. I’ve always liked the way Monster Hunter looks, and I like monsters, so this should be a no brainer. But yet, nope. Maybe it was the controls? If you play Monster Hunter on a regular basis, the controls are now part of your genetic make up. For everyone else, they were oblique. Monster Hunter: World keeps those controls that longtime fans are more than familiar with, but adds new streamlined ones that are more akin to modern games. The shooting mechanics, in particular, have been overhauled in the new controls, so anyone who’s played a recent third-person shooter will feel right at home and won’t have to learn Capcom’s awkward shooting controls. 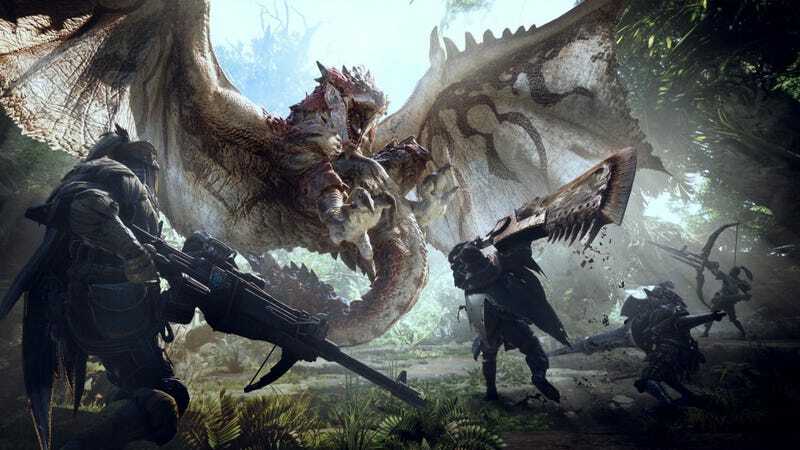 September 22 - 11:00am Update: Capcom has clarified the control options for Monster Hunter: World, telling Kotaku that the traditional way to run or select items are still in Monster Hunter: World. There are also new alternative controls in the game, so players now have the traditional option of running by holding the right shoulder button or the new option of using L3 to run. The weapons, however, have been updated and revamped as have some of the sword combos. More over, for weapon controls, the traditional Monster Hunter input is no longer included. At the Tokyo Game Show, I played two rounds of four player co-op. The in-game world comes alive in a way I hadn’t seen in previous Monster Hunter games. Everything, from the paints to the ants, are teeming with activity. The four of us successfully completed the quest, and I was quickly starting to see the appeal. That appeal hasn’t changed. Now, it’s readily apparent to those trying to get into Monster Hunter. You’re still getting together and hunting a giant monster, but it’s now presented in a way that I don’t have to worry about trying to figure out a very specific control scheme. By the end of the second quest, I didn’t feel like I was battling unintuitive controls and focusing more on hunting monsters, soaking up the rich environments and enjoying the camaraderie of my fellow hunters. This is the world of Monster Hunter. Welcome.